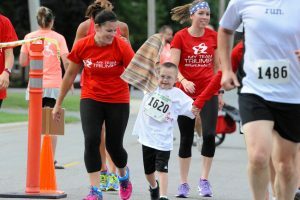 WINONA LAKE – The race was for them, and about them. And Saturday morning’s inaugural My Team Triumph 5K was a smashing success. Smile after smile with high fives and hugs. 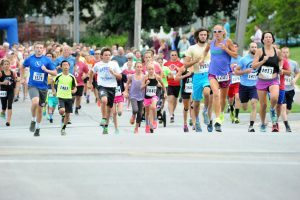 The road race, based at Winona Lake Park and run through the Winona trail system, was started with a pair of waves. The first to go were the Angels and their Captains comprising My Team Triumph – Captained by David Wallen, Jacob Brock, Elias Kinsey, Jamin Irwin, Jacob Irwin, Charlie Sparks, Dea Drudge and Morgan Swafford. With eight Captains and their Angel guides, the goal for My Team Triumph wasn’t to finish first, but to finish. The 5K runners went in the second wave, allowing the Angels to get the Captains out and safely along. 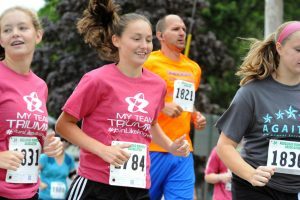 In all, 48 Angels and Captains and just a couple short of 200 runners/walkers hit the 5K grid Saturday. For those counting, Cole Chudy of Bloomington was the overall winner of the race at 17:22, not even closely trailed by Neal Butler of Winona Lake in second place at 18:00. 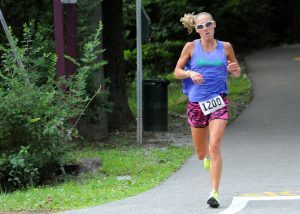 Justina Faulkner of Bourbon continued her strong 2016 running campaign with another win, taking the women’s title at 18:25 and was third overall in the entire race. But the scope of the morning was about the My Team Triumph groups. David Wallen’s team was the first to come home at 23:59, getting pushed in by a pretty special Angel. “I think the reason anybody does this is to give back to people, and these are pretty special people,” said Ben Higgins. “The beauty of life is that you can see all humans, whether they have disabilities or not, participate in an event that is for the common good. I’m excited to be here because you get the smiles and the laughs, but the competing and people just coming together. It benefits not only the people, but the community. My Team Triumph is a national organization that has roots at the local level in Warsaw. 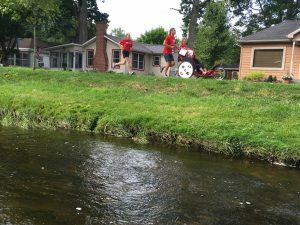 The group is designed to allowed individuals with disabilities to participate in events like Saturday’s 5K, or last week’s Warsaw Optimist Triathlon also at Winona Lake Park. The Angels in the road race’s case pushed wheeled carts across the three-mile course, and in most cases, had the Captains get out of the cart at the end and let them experience the unique feel of crossing the finish line on their own two feet. In some cases, the Captains walked or ran across the line on their own. In other cases, arm and arm with their Angels and a whole bunch of supporters at the finish line cheering either way. “The best part of the day is watching them finish,” said race coordinator Barb Martz, who is also a member of My Team Triumph. “I think this will be big for us. The Captains just loved it. And it isn’t about you or me, it’s about them and making a difference in their lives. That’s all we really care about and why we are here doing this. Full race results can be found here, generated by the help of RunKRA. The start of the My Team Triumph 5K. 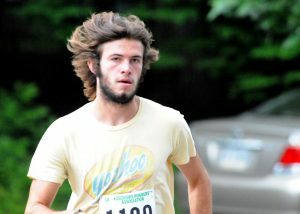 Cody Chudy of Bloomington was the top overall competitor. Justine Faulkner of Bourbon was the top female competitor. Warsaw’s Mariah Rivera takes to the course. David Wallen’s team, aided by Angel Ben Higgins, makes their way along the Winona trails. Elias Kinsey and his Angels cross the finish line.